I had always wanted to go to Alaska , so when my friend Jineen suggested it as a possible vacation destination I thought it sounded like a good idea. Then while researching the trip, I absolutely fell in love with Alaska . Both Jineen and I are drawn to destinations where there is still wilderness, solitude, and new places to explore, and Alaska offers an abundance of these. But the actual experience of the trip exceeded our expectations - we knew we would love the majestic mountains, the spectacular scenery, and the untamed wilderness, but we hadn�t anticipated how much we would like the people along the way as well. Jineen had actually been to Alaska once before, in 1988 with my horse Albany , on the way to Korea for the Seoul Olympics. The plane carrying the horses had refueled in Anchorage , and she had stood on the runway and gazed out at the line of mountains in the distance. She was counting on a closer look this time around. In preparation for the trip, I had read a book titled �Danger Stalks the Land,� which may just as well have been called �100 Ways to Die in Alaska.� After studying many chapters describing death by bear mauling, hypothermia, avalanche, falling down mountainsides and drowning, I knew we were ready. Just to be sure we were totally prepared, Jineen had brought along a book called �Worst Case Scenario,� which gave us instructions on how to survive some of the problems not covered in the first book, such as plane crashes, earthquakes, kidnapping, being buried alive, sinking in quicksand, getting lost . . . well, actually we were prepared for that last eventuality. I had given Jineen a GPS (global positioning system) for her birthday. Never mind that she couldn�t work it and considered it the GPS from Hell, I had a bag of breadcrumbs as a backup plan - hopefully the bears wouldn�t eat them. We felt we had every eventuality covered. We confidently boarded our plane and took our first class seats � hooray for frequent flier miles. We arrived in Anchorage , tired but excited, just before midnight local time, which was 4:00 a.m. on the east coast. I suggested that to save time, while Jineen waited for the luggage, I would go on ahead to the rental car desk and get our car. Big mistake. Little did we realize that due to airport construction and misleading signs, it would be over an hour before we would be able to find each other again. Lost in the airport at the rental car desk, and darn, the GPS is still in the suitcase! We hadn�t paid enough attention to those danger books: First rule of Survival � stay together, never get separated. Eventually reunited, we finally collected our car in the Dollar Rental Car lot. Anticipating rough roads and possibly treacherous conditions, I had reserved a four-wheel-drive vehicle. Expecting some sort of jeep or rugged SUV, we were somewhat dismayed to find we had been given a little Subaru station wagon. We eyed it dubiously; it sat low to the ground and looked like it had never been off the pavement. And indeed, perhaps it hadn�t; the Dollar people informed us that you are not allowed to drive rental cars on gravel roads in Alaska . We hoped this wouldn�t be a problem, since our trip was planned around driving the Denali Highway , 135 miles of gravel road . . .
We drove north to Eagle River where we had reserved a room. We finally got to bed at 2:00 a.m., which was six in the morning in Virginia . We woke up before seven, eager to get on the road. It was a beautiful clear sunny day with temperatures in the mid 50s. We had been a bit worried about the weather because our trip was so late in the season; originally we had planned to come in July, but because of our barn fire we�d had to postpone it until now � and in Alaska, early September is late autumn, and winter is knocking on the door. But this weather wasn�t bad at all! Little did we know that it would be the last sunny morning we would see for a long time. We went to the grocery store and the wine shop to stock up for our �happy hours� through the trip, and we were immediately impressed by how incredibly friendly and nice everyone we met was � we found this to be true throughout the trip. Often is seems there is a direct correlation between how low the population density of an area is and how friendly the people are; by that standard then it would be no surprise if Alaska is the friendliest state in the union. We drove north from Anchorage on Highway 1 (I think there are only about 6 highways in Alaska ). Right away we could see the mountains; the wilderness awaits just outside of the city limits. We passed the town of Palmer (population 5574), and then followed the Fishhook-Willow Road toward Hatcher�s Pass. It was cloudy by this time, and the temperature had dropped into the low forties as we gained altitude. The road became increasingly narrow as it wound up into the mountains. 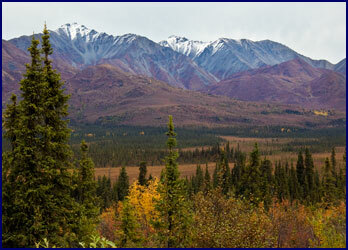 The scenery was beautiful; we stopped at a viewpoint where it seemed we could see all the way back to Anchorage . 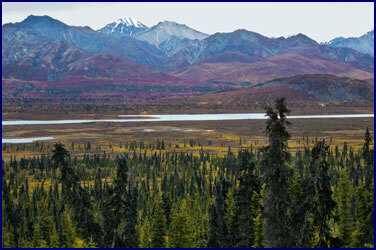 The valley was rich with autumn colors; gold willow shrubs and red blueberry bushes abounded. As we climbed higher our surroundings became more barren, and soon we were well above the treeline, which is only at about 3000 feet in Alaska . We parked at Independence Mine, a large gold mine that dates from the early 1900s. It was closed down in 1951, and is now a State Park. We hiked the Gold Cord Lake Trail, an easy footpath that traverses the rocky slopes up to the lake. 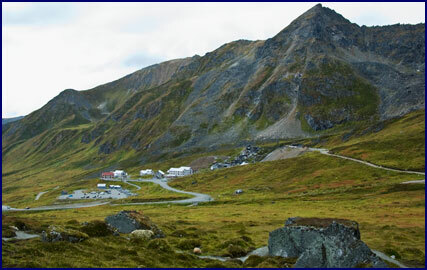 The remains of Independence Mine and its surrounding buildings shrank in our perspective as we climbed higher along the ridge; soon they appeared tiny in the distance. Tundra stretched before us, with a panorama of mountains on all sides. 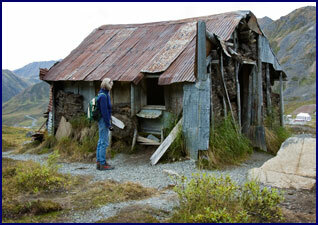 The trail took us past a long-abandoned miner�s hut, made of logs, corrugated metal, and sod. 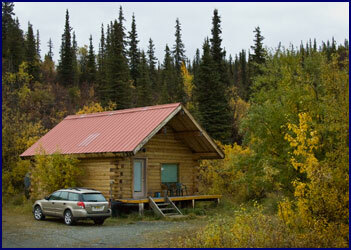 We stopped in for a look; it was difficult to imagine spending the long Alaskan winter there. We surprised an Artic ground squirrel, a small gopher-like creature that sat up on his hindquarters and scolded us for interrupting his solitude. We also got several glimpses of a small rodent about the size of a hamster, with big round ears, no tail, and very quick reflexes; we later learned it was a pika, a distant relative of the rabbit. Finally we reached the top of the slope; though not a difficult hike, it was a lot farther than it had looked from the parking lot. This was our first experience with the Alaskan perspective of size and distance; because the mountains are so huge and the distances so vast, it tends to confuse your perception - we often found that objects or hiking destinations were a lot further away than they had first appeared. We came to the Gold Cord Lake , a mountain tarn surrounded by rocks and huge boulders. There was not much growing up there, only lichens, a bit of moss, some course tufty grass and a few hardy shrubs. The water was a deep turquoise blue color, and looked very clear and cold. A light misting of rain fell intermittently, but there was no wind, and everything was very still and quiet. 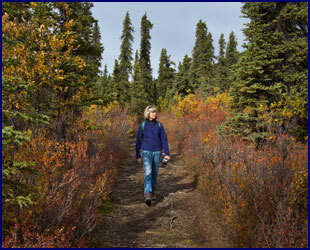 From time to time we saw one or two other hikers, but considering it was a weekend and only about 60 miles from Anchorage, we were amazed at how uncrowded the park was � this was the big advantage to traveling at the very tail end of the season. We worked our way around the edge of the lake, climbing over enormous boulders. 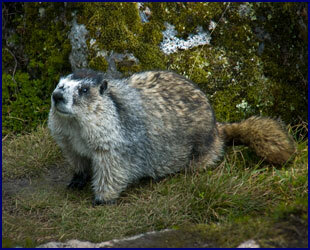 We saw something moving up ahead and slowly crept up for a closer view - it was a Hoary marmot, bigger than its cousin the ground hog, and much more beautiful, with a variegated coat of brown, black and silver. He was not particularly shy, and we were able get quite close. Continuing on to the far side of the lake, we sat on a boulder and snacked on trail mix. We figured that this had been the perfect warm-up hike for our first day; not too strenuous, about an hour each way, just right to break ourselves in gently. Then someone had the bright idea (I think it was me) that instead of going back the way we had come, we should continue around the other side of the lake to return to the trail. It seemed like a good idea at the time. This route turned out to be much steeper and more difficult than the way we had come, and much further around than it had looked (see Alaskan Perspective above). We found ourselves climbing up and down over steep boulder faces and scrambling for traction with increasingly weary legs; now we understood what the guidebooks meant when they talked about crossing boulder fields. Soon our thighs were burning. By the time we made it all the way around the lake and back to the trail, every step was an effort and our legs were like jelly. After this little workout our leg muscles were sore for two days, but it did do the trick regarding training; we never got sore again for the whole trip, even though we did many far more strenuous hikes later. Returning to the car, we drove up Hatcher�s Pass, following the small gravel road up a series of steep switchbacks. (Note that its only day one and we�re already breaking the Dollar Rental Car people�s rule about no gravel roads.) The sky had become overcast, and it was cold and windy at the top. The view was impressive, with silver lakes set high on the pass, surrounded by steep sided mountains. Paragliders launched from a knoll near the summit; we watched them riding the air currents down. We passed dozens of blueberry pickers, gathering the fruit from the autumn-red bushes on the middle slopes of the mountains. Not wanting to miss out on anything, we parked by the road and tried our hand; the berries we found were small, hard and bitter-tasting. By then it was mid afternoon, so we set out for Lake Tolsona , our destination for the evening. We backtracked to Palmer and then followed the Glenn Highway east toward Glenallen. We stopped whenever we saw a particularly interesting spot or beautiful view, which was often. There were many pull-offs with scenic overlooks, often marked with a highway sign with a little picture of a camera, indicating a good spot for photos. One of the best pieces of advice I was given while planning the trip was to buy the Milepost magazine. This is an 800 page atlas that is put out every year, which gives an incredibly detailed description of every inch of every road or highway in Alaska . It advertises itself as �The Bible of North Country Travel,� and indeed, any information you could possibly ask for is in the Milepost. Roads, gas stations, restaurants, stores, scenic viewpoints, points of interest; you name it, you can find it in the Milepost. This is coupled with the fact that in Alaska all of the roads are marked with actual mile posts, and everyone refers to these when giving any kind of directions. 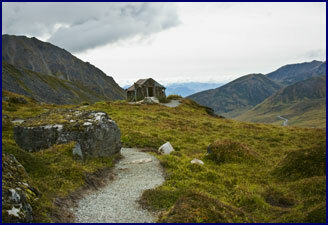 For instance, if you tell someone you will be at mile 67.3 on the Glenn Highway , everyone knows exactly where that is. It is a great system, and very convenient, though I suspect it might not work as well in states that have more than six roads . 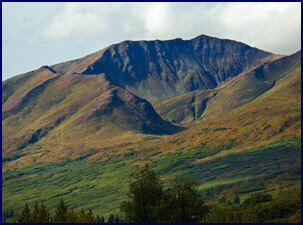 . .
We were driving along with the Chugach Mountains on our right. We stopped a few times for photos, but otherwise kept going, trying to cover some ground. We noticed that our little Subaru didn�t like to go too fast; it would start to shimmy and shake every time we approached 60 mph. We were really lucky with our timing; there was major road construction on the Glenn Highway � signs said to expect 1 hour delays. As we approached the construction area we saw a line of cars coming toward us; we realized they had just been let through the construction area, so our lane would be let through next. But if we missed it, we would have to wait an hour or more! I floored it, driving at speeds that caused our little car to tremble like a leaf, and we just barely made it in time � we were the very last vehicle to be let through. We drove through ever-changing countryside. 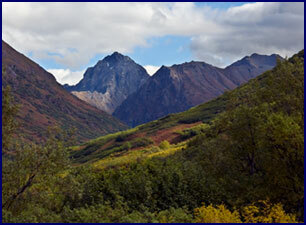 Much of our route was lined with majestic mountains; the Chugach Range still marched on our right. We passed a huge icefield, which we learned from the Milepost was the Matanuska Glacier. At milepost 131 we could see Mt. Drum , tall and snow covered on the horizon, and the Nelchina Glacier was over our shoulder. In these vast landscapes we would often see another car in the distance and think that it seemed smaller than it should be; then we would realize the scale of things and know that we were experiencing that Alaska Perspective again. Temporarily leaving the mountains behind, we drove through extensive areas of gently rolling tundra dotted with Black Spruce. Everywhere we looked there were lakes. 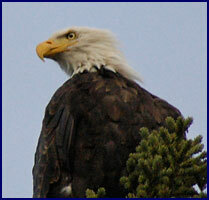 We ecstatically watched a bald eagle soaring alongside the road, and further on we saw another, paralleling the highway. We kept a good eye out for caribou or bears, and we stopped at an overlook by Leila and Tahneta Lakes to search for moose, but the only mammal we saw was a dead porcupine in the road. Curiously, we passed through several stretches where there was a series of poles along the side of the road, coming straight up for about 15 feet then jutting out over the road. To determine their purpose we consulted our trusty Milepost; we learned that the poles were there so the snowplows could find the road in winter. We arrived in the town of Tolsona , population 24. We were staying at the Tolsona Lake Lodge, which turned out to be not nearly as classy as it had appeared on its website. Our room was adequate, with a view of the lake and the equipment shed. There was a tiny airstrip out back. A bristle faced dog followed us, staring at us with creepy intensity each time we ventured out of our room. The atmosphere in the restaurant and bar was disappointing. The waitress was very tired and harried looking - she had been on duty since 7:00 a.m. and would work until the karaoke in the bar finished at two in the morning. We had an extremely mediocre dinner at a very high price; this turned out to be the only over-priced place we ate at for the entire trip. From the restaurant window, we watched a loon on the lake in the twilight; it would dive under the water and seem to disappear, finally coming up five minutes later, over 200 yards away. The waitress told us that a bear had been shot there last week because it was breaking into the sheds, and she also said that a mother grizzly bear with her babies had been hanging around the lodge just the day before. She cautioned us not to go for a walk. Fortunately we were in the last room on the row, so if they had Karaoke at the bar until 2:00 a.m. we couldn�t hear it. We slept like logs. It was raining when we woke up. We got a closer look at the loon on the lake; they are bigger than I had realized. We left Tolsona Lake and hit the road. First stop: we needed gas and caffeine. In Alaska , towns and especially gas stations can be few and far between; it can be hundreds of miles to the next stop, so never let the gas get to less than half a tank. The same could be said of the caffeine. We had breakfast at an old roadhouse at Caribou Creek. Several people had told me about the great Sourdough pancakes in Alaska and I was eager to try them, but they had none. However they did have nice people, a great atmosphere, and delicious huge helpings of biscuits with sausage gravy. After breakfast we drove on in the rain, heading east on the Glenn Highway . We saw two magpies fly up in the road; a good sign - one for sorrow, two for joy. 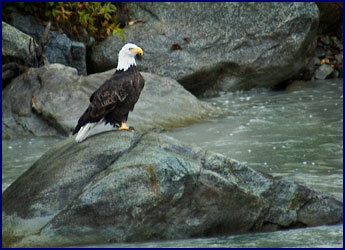 A bald eagle stood on a rock in the Gakona River , and we photographed him from the bridge. A pair of regal white swans floated on a lake near the road, along with several ducks. It looked like a good lake for moose, but none were to be seen. Gold aspen trees mixed with the tall thin black spruce so prevalent in the low lying areas. These dark spruce trees were intriguing; they were thin and sparse and somewhat stunted looking, often with oddly shaped tops that resemble weird and twisted faces. We crossed the braided Gulkana River , with its interwoven channels criss-crossing through the gravel bars; we imagined the huge torrent it must be during snowmelt in the spring. We saw the mighty peaks of Mt. Sanford and Mt. Drum , clothed in white, with a band of mist across their middles. We passed by the Gakona roadhouse, said to be haunted. Our destination was the St. Elias/Wrangell Park, which consists of over 20,000 square miles of untracked wilderness, and is the largest National Park in the United States , more than six times the size of Yellowstone . It has glaciers larger than Rhode Island ! It is also one of the least visited National Parks in the country; most access is by small plane, to drop off campers, hunters and backpackers who spend days or weeks out in the wilderness. For us less intrepid travelers, there are only two roads that lead into the park at all; McCarthy Road and Nabesna Road . Of these two, McCarthy Road is much more traveled, with the historic town of McCarthy at the end of it, while Nabesna Road is pretty much nothing but wilderness. Guess which one we took. The rain was starting to let up by the time we turned on to the Nabesna Road; it was cloudy, but with occasional light patches in the sky where one could imagine the sun to be hiding. We drove about 20 miles down this small gravel road (yes, there we go again, breaking the rental car rules), where we found the trailhead for the Caribou Creek hike. The trail started out through the woods as a four-wheeler track of deep sand and gravel dust, difficult to walk on. After crossing several muddy creeks our route narrowed to a dirt path criss-crossed by roots. We wound through the woods and came out in an open meadow, where we had a great view of the mountains beyond. 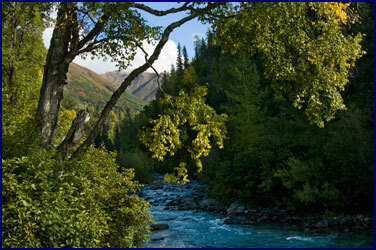 Soon we were back in the trees again, walking beside a swift rushing stream, uphill toward the base of the mountains. We passed several tents and hunter�s camps. We found moose tracks along the way (they looked nothing like the ice cream), and plenty of moose droppings. But sadly, no moose. Eventually the trail petered out along the rocky stream, and we headed back. 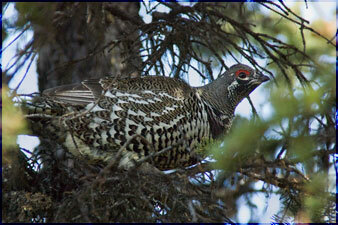 A chicken-sized bird flew across our path and up into a tree; it was a ptarmigan, mottled in color, with its feathers just beginning to change to white for the coming winter. It perched in a tree next to the trail, affording us a good close look. 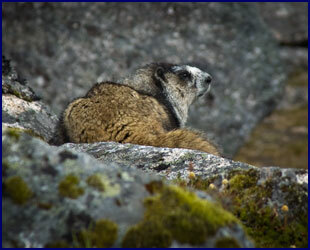 We had seen very little other wildlife on the Caribou Creek Trail. After three hours of hiking we returned to our car. We drove back out the Nabesna Road , down the Glenn Highway , and then headed north on Highway 4, the Richardson Highway . We stopped for Cokes at Posty�s Trading Post, and then made tracks to our destination for the night. Jineen and I like to travel without making advance reservations, to just see where we end up each night and find lodging on the fly. But when I researched this trip, the people I talked to advised me to always have reservations in advance in Alaska ; they said that the towns are too few and far between to count on finding lodging on short notice. If you get to a town and there are no rooms available, it might be 200 miles to the next one. When we arrived in Paxson, we understood what they meant. The map showed Paxson to be a town located at the junction of Richardson Highway and the Denali Highway , but when we got there we realized that they were using the term �town� loosely. Paxson actually just consisted of a lodge, a roadhouse with a really bad restaurant, a gas pump, and a population of 37, which includes everyone who lives in a 30 mile radius. In rural Alaska , it seems that if you have a gas pump, you automatically qualify as a town. Audubon (Audi for short) and his partner Jenny were very informative about the area; they even told us about a good place to see moose that we could visit that very evening. But first we found a spot with a nice view on the top of the hill, parked, and had our happy hour. This is a tradition Jineen and I have refined on our trips - a bottle of white wine, a little pate, some cheese and chutney on crackers, perhaps some fresh bread or fruit; on this evening it also served as dinner. It was almost 7:30 when we set off on foot for Mud Lake . We crossed the road, went over a bridge, turned by the gravel quarry, and then followed a path down through the woods. It was starting to get dark, but the weather was still pleasant, around 50 with a nice breeze. As we walked we saw moose tracks in the soft earth under our feet. After about 15 minutes we came out of the trees and crossed a marshy field; a large shallow lake stretched before us, with steep hills rising beyond it. We could hear the calling of loons, an eerie sound that sends shivers down the spine. 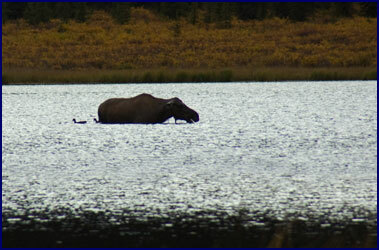 There was a large dark shape in the water - a moose cow, silhouetted against the silvery sheen of the lake in the fading light. She stood out in the middle, belly deep in the water, plunging her head under the surface to eat the aquatic plants on the lake bottom. She would submerge her head for over a minute at a time, and then come up munching contentedly. Two ducks swam close beside her, feeding on her leftovers. She appeared totally unconcerned that we were watching. A family of swans floated by the far shore; two more arrived and flew several times around the lake in perfect synchronization before leaving without landing. The loons called again. It was incredibly peaceful - we stood there a long time watching the dusk turn to night. On the way back we stopped on the bridge and gazed down at the stream, where dark red salmon were fighting their way up the swift current. They would cluster in groups of 5 or 6, lurking below a riffle; then one after another they would make their move, fighting their way upstream a dozen feet or so, where they would gather to rest again before having another go. It gave me a great appreciation for the arduous difficulty of their journey. We returned to our cabin, finished the wine, negotiated the outhouse by flashlight, and slept snug in our comfortable beds.